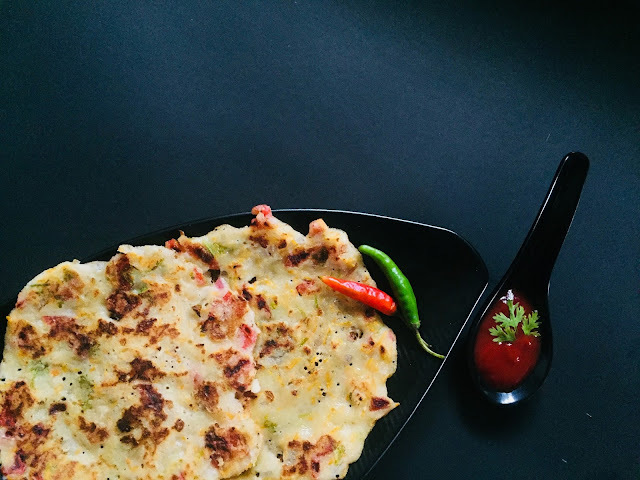 Rava uttapam recipe with step by step photos. Rava uttapam recipe is a very simple yet delicious recipe. It is a lazy recipe. Just soak rava for 3-4 hours. or maybe overnight. chop your favourite vegetables and start preparing uttapams! Unlike other dosa/cheela, you don't need to soak dal/rice for few hours then grind it and then ferment the batter before you can actually prepare it! I usually prepare it next day after preparing Paneer. Rava/Sooji can be soaked in the water left after preparing paneer. Otherwise, rava can be soaked in curd and water. A lot of vegetables are added which takes its nutrition to another level. Vegetables like onion, tomato, carrot, capsicum, cabbage, spinach and even beetroot go really well with rava uttapam. You can also add grated Paneer. Try adding the different combination of vegetables and let me know which one is your favourite in the comment section below. Soak rava with curd and water for 3-4 hours. For both the methods it is important that the pan should be warm, not hot. If you are finding it difficult to spread the batter then your pan is too hot. For cooling it you can wait after each uttapam and rub onion/potato on your pan. Heat a non-stick pan. Put 1/4 tsp of oil and use a napkin to spread it evenly. Put 1.5 or 2 Tbsp of batter at the centre of the pan. Spread it in the circular motion. Just like Dosa. Sprinkle vegetables. Press them slightly on the uttapam. Once the colour of the batter is dark and the corners are little brown, you can flip it. Apply some oil. Roast it from both the sides. The flame should be medium-high. Mix all the vegetables in the batter itself. Once the colour of the batter is dark and the corners are little brown, you can flip it. Apply some oil. Roast it from both the sides. The flame should be medium-high. Rava uttapam is ready! 1. Take 2 cups of rava. 2. Add 1 cup of curd. 3. Add 2 cups of water. 4. Mix everything well. Soak it for 3 to 4 hours. 6. Heat a pan. Add 1/4 tsp oil. Spread it evenly. 7. Spread the batter and sprinkle the chopped vegetables. Apply oil and roast it from both the sides. 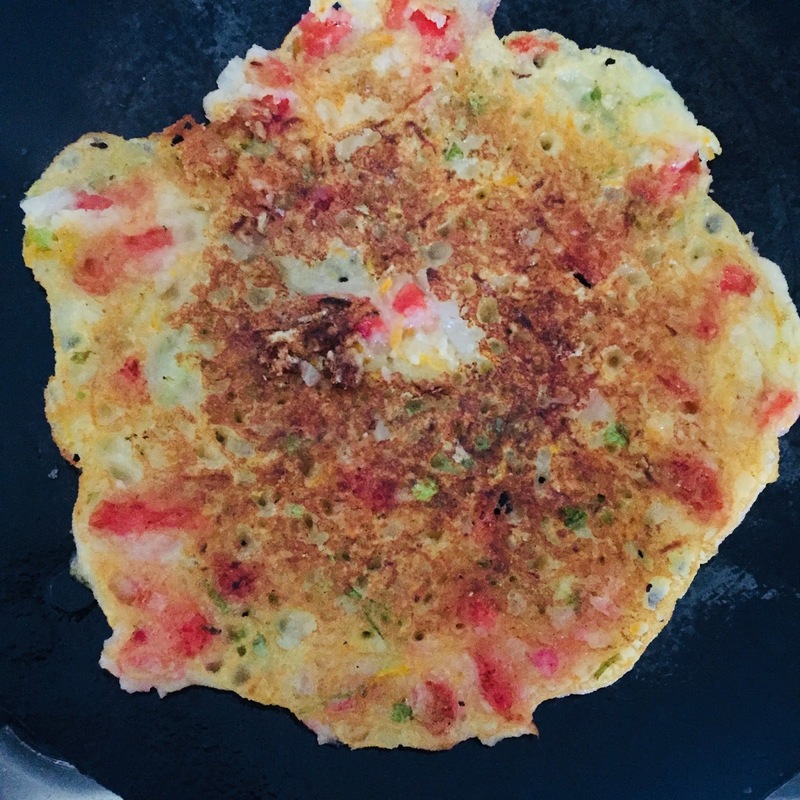 Uttapam is ready! Spread the batter evenly and sprinkle the chopped vegetables. 8. For the second method, we can simply mix all the vegetables in the batter itself. 9. The batter is ready. 10. Same as method 1, heat a pan. Spread oil evenly. Then spread the batter. It won't be as even as it was in method 1. 11. Apply oil and flip it. Roast it well from both the sides. 12. Uttapam is ready. Serve it hot with your favourite chutney or ketchup. Use the finest quality of rava. Instead of soaking it in curd and water, you can also use the water left after making Paneer. Make sure that the pan neither too hot nor too cold while spreading the batter. If it is too hot then you will not be able to spread the batter evenly. If it is not at all hot then you will not be able to flip it easily. You can sprinkle some water on the pan after spreading the batter. Cover it and cook on medium-low flame. You can avoid using oil completely. Uttapam will be soft and you can prepare it without a single drop of oil.